Hawthorne Cat, the exclusive Cat equipment dealer in San Diego, the Hawaiian Islands, and the Pacific Region has made upgrading your fleet better than ever with three times the benefits. "There’s never been a better time to upgrade your fleet with our great offers from Hawthorne Cat,” says Ross Farmer, Sales Manager. Hawthorne Cat®, the exclusive Cat equipment dealer in San Diego, the Hawaiian Islands, and the Pacific Region has made upgrading your fleet better than ever with three times the benefits. Purchase a qualifying new Cat machine now until December 31, 2018 and receive 1.9% financing for 48 months, a Powertrain Equipment Protection Plan (EPP), and 3 years of planned maintenance parts kits on select new Cat machines. Keep your business growing with our wide range of new inventory available at Hawthorne Cat. 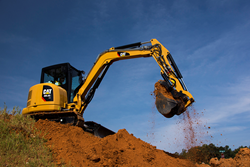 Select new Cat machines include: Backhoe Loaders, Compact Track Loaders, Compact Wheel Loaders, Mini Excavators, Multi Terrain Loaders, Skid Steer Loaders, Small Dozers, Small Wheel Loaders, and Telehandlers.